You all know how much we enjoy being able to park for the day and walk to multiple stops. The River Market District in Little Rock, Arkansas is one of those kind of destinations. Sitting along the Arkansas River, we expected to catch views of plenty of wildlife. 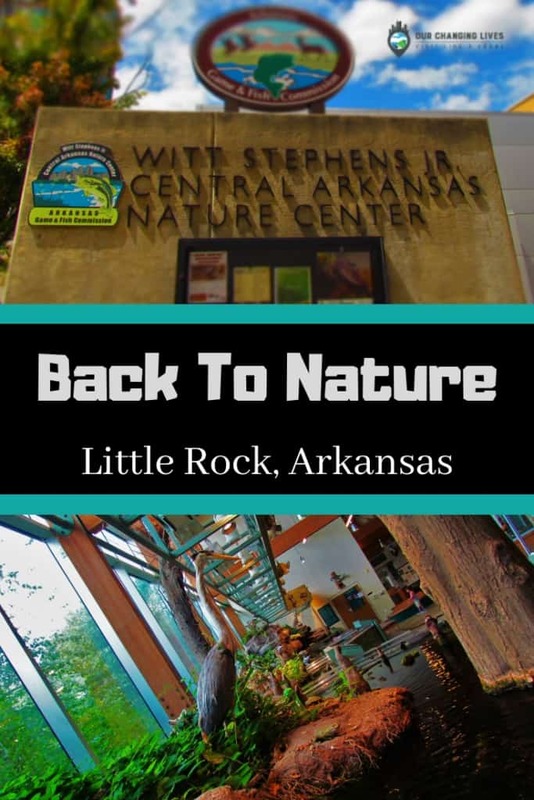 A stop at the Witt Stephens Jr. Central Arkansas Nature Center would help us know what to look for and identify the creatures we might see. Arkansas is made up of six distinct environments, which the Nature Center helps describe. Each has its own unique inhabitants, but the water they share links them. It is quickly clear to us that Arkansas is a sport paradise. Fishing, hunting, hiking, and observing is a little different in each area. 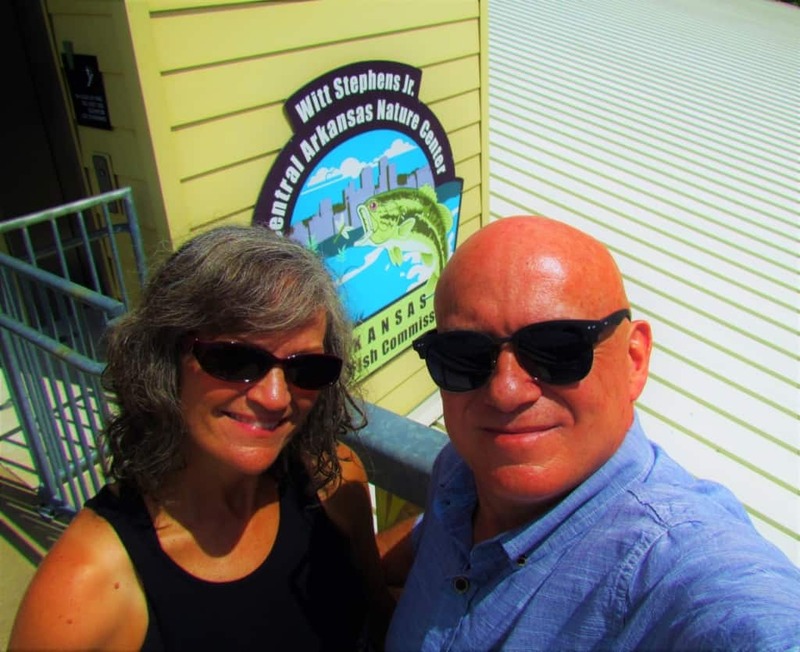 We are very familiar with the Ozark Plateau, since we love visiting the Eureka Springs area. (You can see an overview of our last visit here.) Some of the other districts are less familiar, and there are some we have never visited. I guess we will need to start adding new zones to our travels. The Nature Center is FREE to the public, since the upkeep is covered by a conservation sales tax. As we meandered through the center, we noted the long aquarium display. It holds a mixture of taxidermied animals that are native to the region, as well as some live fish specimens in the tank. Light from the oversized windows makes the area quite relaxing to just watch the fish swim. A highlight of the Nature Center is their 10-minute introductory film. Presented on a large screen, the room seats about 60 people. 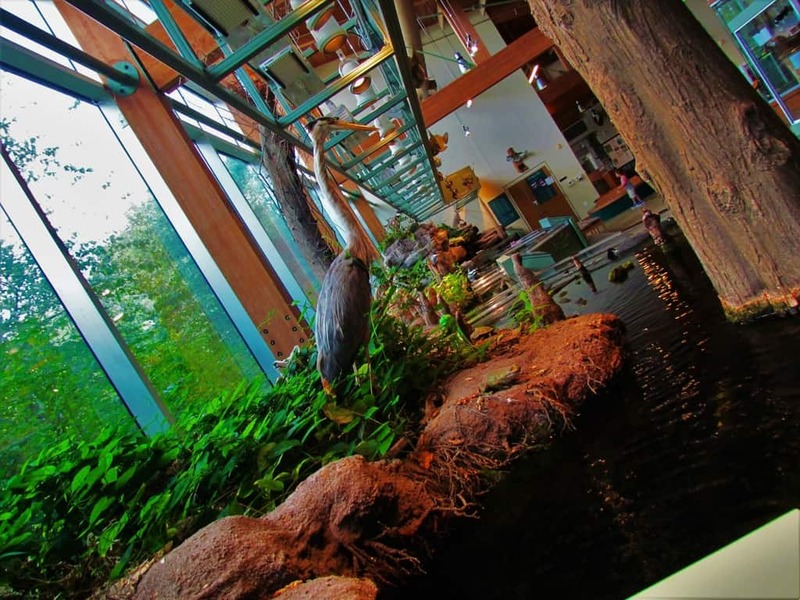 The Nature Center also offers various programs designed to engage with visitors. If you are visiting on the correct day, you may see fish or alligator feedings. At other times there are storytellers who helps educate about many of the creatures found in Arkansas. Standing opposite the large water exhibit, we found a series of smaller exhibits. These highlight the three main areas of focus for the Arkansas Game & Fish Commission, which is the agency that regulates law enforcement, fisheries, and wildlife management for the state’s wildlife areas. Many of these displays, not only tell the story about the agency’s actions today, but offer historical information. 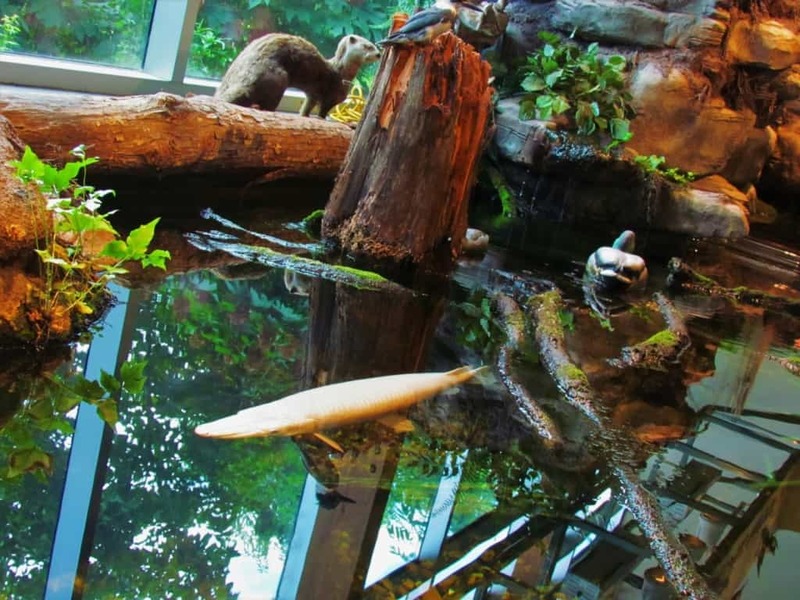 With so many waterways found in Arkansas, it makes sense that the Nature Center would have numerous fishing exhibits. Deep inside the Nature Center we found a mock trapper’s cabin, as well as a fishing camp. 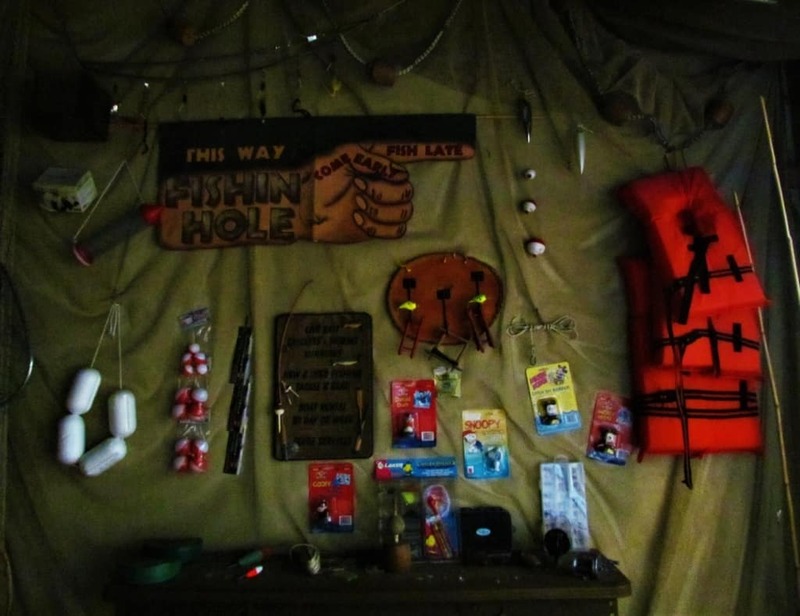 I haven’t done much fishing in years, so many of the displayed items brought back fond memories. As a youth, we would spend many hours fishing in the strip pits of southeastern Kansas. It certainly made me think about those simpler days. Along one wall, we found a large display of fishing equipment. Rods, reels, lures, and various tools line the exhibit. As I inspected pieces, another visitor struck up a conversation about fishing memories. It amazes me to think about the ability of a simple artifact, like a certain lure, to dredge up long forgotten memories. I spent quite a bit of time scanning this display, and found tons of familiar items. We wonder how many will be familiar to you. As we mentioned earlier in the article, the Central Arkansas Nature Center is located close to lots of other activities. About a block away is the Little Rock River Market, which houses a variety of dining options with open seating in the middle. Lots of small boutique style shops are located up and down the street. 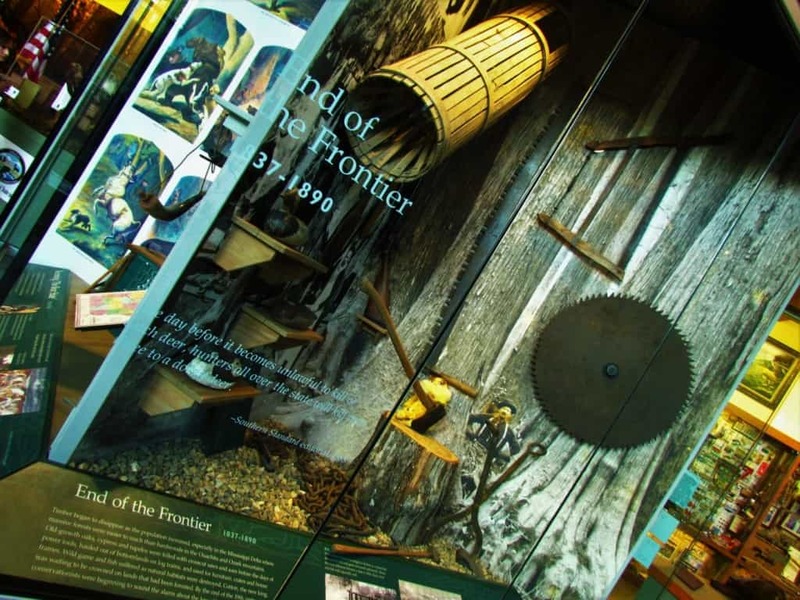 Next door to the Nature Center is the Museum of Discovery, which is an amazing all ages, hands-on science center. (You can read more about it here.) The Arkansas River Trail runs behind the Nature Center, as it follows the bank of the Arkansas River. This whole area is filled with enough sights to keep a family busy for a couple of days, so you will definitely want to schedule plenty of time for exploring. How many of the six distinct Arkansas regions have you visited? Share this with your nature loving friends! Johanna, thanks for stopping by. We loved the trail, and found that they have renovated old train bridges into pedestrian crossings. It’s a real fun place to explore.